Kent's best example of a Motte-and-Bailey Gatehouse, one of the finest in England. When William the Conqueror came to England in 1066 he brought with his the concept of the castle. He and his men, of which were 12'000 at most, needed rapidly to make themselves secure amongst a potentially hostile population of one and a half million, and simply the easily- built fortresses was the answer. Norman lords were put in charge of the construction of castles: Tonbridge was entrusted to Richard de Clare. Read Tonbridge Castles history here. 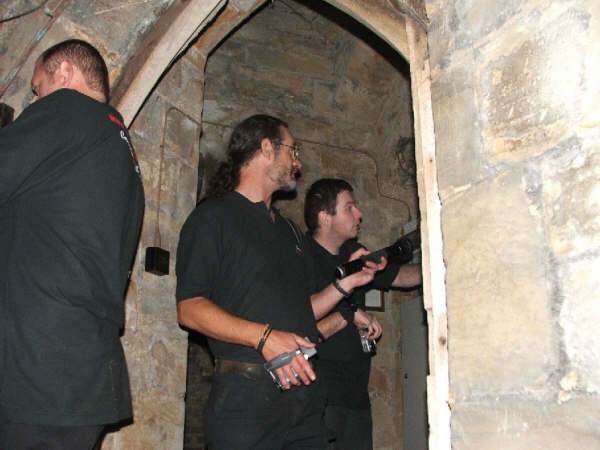 One of the security staff had reported to us seeing an unexplained red light from outside the castle through the first floor privy window on a previous night. No other phenomena are known to be reported here. The team arrived at Tonbridge Castle at 1800 and after an obligatory KFC and a conversation with the security officers and a quick recce then started to set up base camp in Council Office next door and discuss equipment set up and investigation methods. 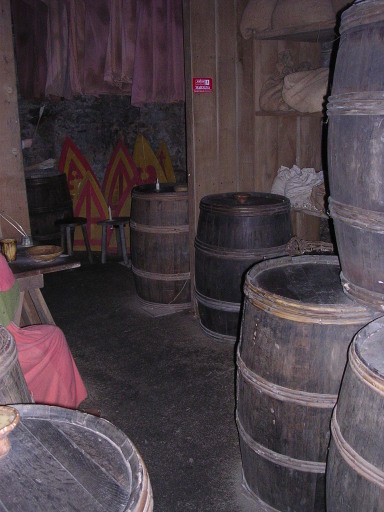 During the next hour and a half the equipment was set up in the stated location in the Gatehouse building which is the only part of the mediaeval castle to remain intact, and the team conduct a familiarisation walk around taking photographs. At 2040 hours the investigation started in Gatehouse. The team entered the Great Hall / portcullis room. 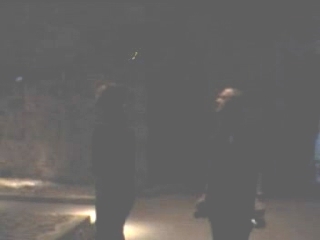 Kim starts filming and sees a light anomaly with the naked eye between Ian and Dave. A quick check of the footage reveals that this has also been caught on camera. It is currently unexplained appearing in still frame as three small light sources of varying colours with an ‘aura’ of colour around it. Ian feels breathless part way into the vigil. Dave sees a moving circular light anomaly in the area of the arch over the archer dummy in the north east turret recess. Tapping noises were heard in the area of the south windows but this was established to be the wooden shutters and hinges. 2130 Invest in Hall ends. From 2200 the team investigates the west stores positioning on staircase from stores up to guardroom and the area below. Voices of passers by are heard in the area of the public access through the centre of the gatehouse however on more than one occasion a loud bang is heard from the area of the guardroom above but seeming to come from the outside of the west wall. Due to the ruined nature of the rest of the castle there is no access from the gatehouse to this area of curtain wall. It cannot be said with any certainty what was responsible for the noise but it is currently unexplained. This session was recorded on voice recorder and video and questions were asked to initiate a response with the possibility of EVP. None were recorded. Investigation here ends at 2240. 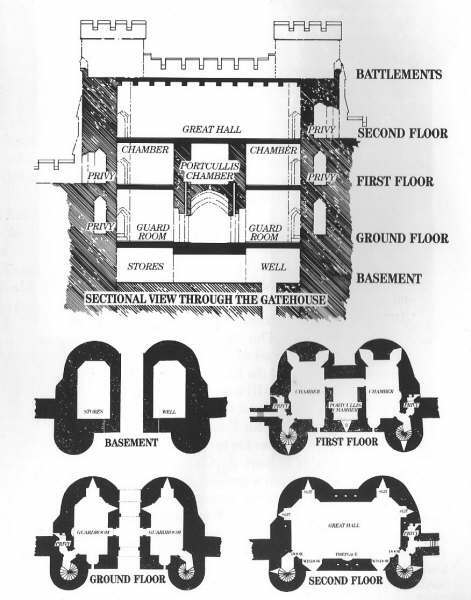 From 2350 until 0015 hours the team conduct a vigil at the top or the south east staircase which is incomplete and stops on a level of a door into the Great Hall which cannot be accessed due to the lack of floor. Nothing is experienced or reported in this area although there were some noises which had previously been established as the flag rope against the flag pole mounted on this turret. During this vigil voice recordings and video filming was undertaken. Again no EVP was recorded but Kim feels apprehensive and nervous in relation the stair area. From 0025 until 0130 the team conduct a vigil in the east guard room. Nothing is reported. From 0215 until 0310 the team conducted a ‘pendulum experiment’. A crystal pendulum was suspended from a free standing chrome frame stood in the centre of the portcullis room. The team then sat on chairs 3 feet from the pendulum which was steadied as much as humanly possible prior to be left. It was subject to overall filming from the previously set up CCTV. 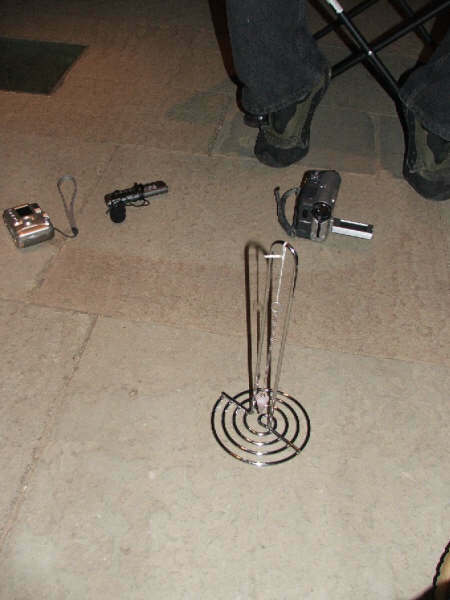 Paddy and Dave placed their video cameras on the floor and ‘zoomed’ to record and view the pendulum during the course of the experiment. A general conversation ensued about the experiment during the course of which spirit were invited to come forward and move the pendulum if they wished to show a presence. The pendulum appeared to move slightly in a swinging motion at various points during the experiment and also to ‘twist’ about its vertical axis particularly when encouraged. No draughts were experienced or detected although it is conceded that the slightest draught may account for some movement. The team cannot so far account for the twisting motion seen. This experiment is currently under revision to eliminate any possibility of outside interference or natural phenomena such as undetectable draughts. When the resulting footage was reviewed it was found that 7 seconds into the session there is a pause in a sentence Kim is saying before she continues with the words ‘the energy of the crystal’. In the pause and overlapping ‘the’ a male voice that is not one of the team can be clearly heard to say the word ‘ENERGY’. The team consider this to be evidence of EVP (Electronic Voice Phenomena) and a clip of this will shortly appear on the site. This investigation was conducted on a Friday night after a days work (for some of the team) and tiredness was setting in. No further experiments were conducted although a walk around of the entire site was conducted before the investigation concluded at 0430. Several audible sounds were heard although the majority were explainable and found to be due to building movements or wind. Some however were not explainable. One light anomaly was captured on camera which currently we cannot explain. Nothing of note is believed to have been captured on the CCTV although the CCTV in the hall / portcullis room are did not record a picture. This is believed to have been due to an error in the recording. The voice on the camera footage, sporadic pendulum movements, the light anomaly in the hall area and a few noises heard from the stores are currently unexplained. On the wall opposite the privy window where the red light was seen by a security officer there is a fire escape light with a red illumination. However, whilst in the area of the window it is unlikely to be visible from the angle of elevation viewing this from ground level from the outside. As stated above several noises were heard and a light anomaly was caught on one of our cam corders but at this moment in time are results are inconclusive. There was an amount of information forthcoming of a clairvoyant/psychic kind, but this cannot be validated. As Ghost Connections conducts scientifically based investigations we do not publish such observations, however, this information is held on a separate database and may prove interesting when compared to other peoples experiences. Should you wish to discuss this information please email us. We would like to thank the security staff and caretaker for their assistance in the evening.